Baremetrics has grown faster than anything I’ve ever built before, both from a user/usage standpoint and (most importantly) from a revenue stand point. I was able to go from initial idea to over $5,000/month in recurring revenue in exactly 5 months. So, for both posterity and usefulness sake, I’ll walk you through a few things I learned through that process. Baremetrics was birthed out of my frustrations with the other “solutions” out there. Nothing ever worked quite right. They all required a lot of dev work to hook up correctly, and I didn’t trust myself that I was actually sending over all the data those tools needed to give me the metrics I wanted. Plus, digging in to each metric was borderline impossible. I’d been using Stripe for a couple of years on two other products and so knowing Stripe had all this data (really, just about everything I’d need to calculate what I wanted), it made it a no-brainer to just build a tool that crunched all the numbers from there. October 14: Initial idea. Sitting in front of my computer smashing my head on the desk in frustration, I vowed to build this. Month 1: $0. Building the thing like a mad man. Not available publicly yet. Month 2: $1,000. This is the first month Baremetrics is out in the wild. I charged from day one (and you should too…more on that in a bit). Month 3: $1,650. Learning more and more about how people want to use Baremetrics and slowly but surely growing. Month 4: $3,200. Well, well, well. What do we have here? Doubled MRR! That’s what! I’ll cover how I did that later in the article. Month 5: $5,300. I crossed my personal goal of $5,000/mo in 5 months to the day. Month 6: $8,300. This is basically where we’re at today. Let’s jump in to a few takeaways/tips/methods that you may find useful in your journey towards making bucket loads of cash. We could debate in to the ground whether you should scratch your own itch. Me personally? I think scratching your itch is a fantastic start. Does it guarantee success? Heck no. But scratching your own itch gives you a leg up on people who are just picking things out of thin air based on their perception of problems in markets they have no experience in. At the very least, you’re able to learn faster if a product is a good idea because you’re able to talk to more customers more quickly and can relate to them more readily. Worst case? You’ve solved your own problem. You’ve undoubtably read a slew of articles on how to validate your business or product. Unfortunately, all of those validation methods are bogus. There is only one type of validation, when building a sustainable business: money. 1,000 people on your mailing list is not validation. 1,000 people on your free plan is not validation. 100,000 Twitter followers is not validation. And what you need as a business in its earliest stages is validation. Otherwise you risk wasting colossal amounts of time doing something people potentially have no interest in. Many of us have a psychological barrier to asking people to pay us. We’re afraid they’ll tell us “no” or that it’s not worth what we’re wanting to charge, but finding that out if they will pay you is absolutely vital. That Reid Hoffman quote…money. Literally will print money for you early on if you take it to heart. 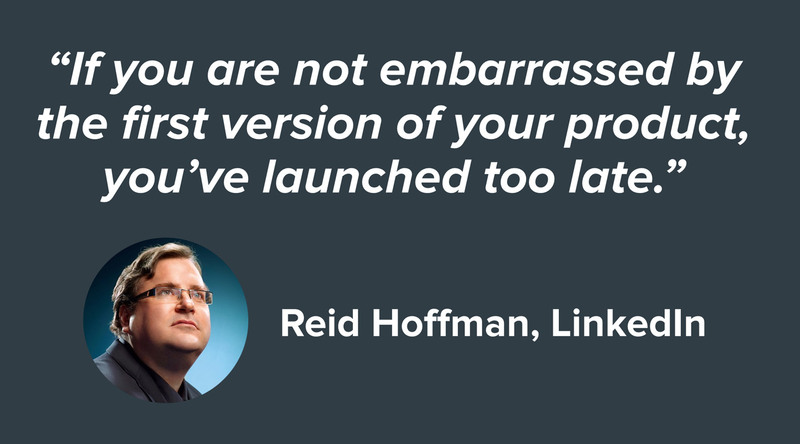 No one will remember how polished your product was/wasn’t when you first launch (hardly anyone will even know you launched). They’ll only remember if your product created value for them. Going back to the previous point…you need validation for your business. By shipping as fast as possible you’re able to find out as soon as possible how to best serve your market. But guess what? The first $2000 in recurring revenue came from that version. Launching with that raw version let me get it shipped it a month and immediately get feedback from paying customers. It bought me time to learn what Baremetrics needed to do outside of the “scratching my own itch” phase. The feedback was actually worth something. The only feedback I listened to was that from people who were actually paying me. They had a vested interest in seeing Baremetrics succeed and so their input was legitimately valuable. So, 2 months after being live for everyone to use…I scrapped everything and rebuilt. Literally started over. New Rails project. New app in Heroku. New design. New frontend code. New everything. All based on feedback I received from paying customers. And the result? I doubled my MRR in a matter of a couple of weeks. I created more value and in turn, made more money. The first version of Baremetrics was built in about 8 days. But that was spread across 30 days of juggling client work, two other SaaS products and 10 days of international travel with no access to really even think about Baremetrics. So, you have no excuse for taking months upon months (or even years) to ship. You’re procrastinating. You’re giving in to the Resistance. But even after you get your initial product out the door, you keep shipping features fast and frequently. Ship basic, MVP-versions of features to find out how (or even if) users want to use that feature and then iterate on top of it. A $9/mo customer is an entirely different customer than a $99/mo customer. They’re a different sales process, they’ll use your product differently and, more importantly, they’ll have drastically different support loads. That $9 customer will likely make up the large majority of your support requests. They’ll demand the most. They’ll nag you the most. And they’re the most likely to jump ship when a competitor comes out with something similar and charges $8 for it. You don’t want to build a business on customers who will spend more at McDonald’s for lunch than they do on a product that creates value for them. You want customers who aren’t price conscious. That $99 customer is happy to fork over the cash because they’re mature enough to know that anything that saves time/money or creates value is worth paying for. They’ll also be exponentially more loyal. They don’t waste their time looking for things that are marginally better…they pay for what works the most and then they get back to building their business. As a general rule, if the businesses you’re targeting don’t charge much money, don’t expect to make much money from them. So, there you have it. Some takeaways and methods I used to get Baremetrics out the door and making money. As usual, you can always spy on how we’re doing at our live demo, which uses our actual numbers. What are some things you’ve found useful when building a new product? Note: I gave a talk on this very topic earlier this week at MicroConf in Las Vegas, so here are the slides from that talk. Feel free to share it, pick it apart, print it off and eat it…whatever feels right.